Half gallon of gently pasteurized whole milk delivered to your doorstep. The Earth has a population of 7.6 billion. Of that number, more than six billion people get nine of their essential nutrients from one beverage: milk. (If that doesn’t impress you, well, we don’t know what will!) And good news for you - we happen to deliver it to your door. Smith Brothers Farm Whole Milk is rBST-free and gently pasteurized for that farm-fresh flavor. One sip, and you’ll never want milk from the grocery store again. Hearty muffins bursting with fruit and a coating of crumbly streusel. Tillamook Medium Sliced Cheddar Cheese - 12 oz. Award-winning, naturally-aged cheddar pre-sliced for your convenience. 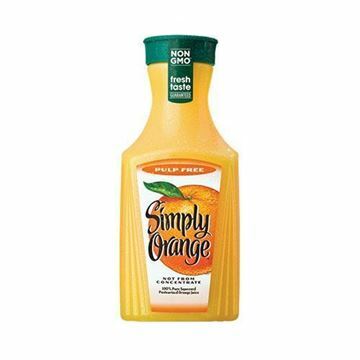 Simply Orange Juice Pulp Free - 52 oz. Premium, not-from-concentrate orange juice without all the pulp. Daily's Honey Cured Bacon - 1.5 lbs. Thick slices of honey-cured hardwood smoked bacon. Only milk my kids will drink now. Sad house if we run out! The past 3 half gallons we have received have gone bad within 7-10 days, days prior to the pull date. This is by far the best milk I've had since growing up on farms with our own cows. I love Smith Brothers milk! I've been a customer for several years and I always have liked their milk. It's far better than store bought. It almost always lasts well beyond the date stamp and taste is GREAT! Also no hormones. Can't be beat! This milk is the best. You can taste the difference in freshness--once you try it, you won't want to go back to cheap grocery-store milk. We grew up drinking milk on a farm , Smith Brothers Milk is just as good if not better !